2. would be a risk of behavioural disorders. A continuous relationship between child an mother (or mother-substitute) is important. A relationship that is discontinuous becomes unstable and less predictable. This in turn disrupts the development of attachment.The development of this continuous relationship must occur during the critical period. If a child experiences repeated separations (before 2 1/2 years old) they are likely to become emotionally disturbed. There is a continuing risk of disturbance up to 5 yrs old. After that children are better able to cope with separation. Bowlby did not say that the relationship had to be with the child's natural mother.Maternal describes mothering from either the natural mother or a mother-substitute. 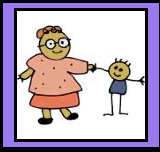 Monotropy: A child needs to form a relationship with one primary caregiver for healthy emotional development to occur. Aim: To see if early separations were related to behavioural disorders and to test the maternal deprivation hypothesis. Procedures: 88 children (5-16 years) referred to the child guidance clinic. Interviewed the children and their families regarding their early life experiences. It was found that 86% of affectionless psychopaths frequent separations from their mother in early years. Where as only 17% of the other thieves had frequent separations. The control group in comparison reported less than 4% of children to had separations. There is an association between early separations and later social and maladjustment. Severe deprivation may lead to affectionless psychopathy, whilst less severe deprivation may lead to antisocial behaviour (theft). One criticism of the Maternal Deprivation Hypothesis is that the evidence presented by Bowlby is correlational. This means that we cannot infer cause and affect. In this situation we cannot state that deprivation causes affectionless psychopathy or delinquent behaviour. We can merely identify that there is a link between the two. A second criticism of the Maternal Deprivation Hypothesis is that Bowlby's data on separation was collected retrospectively and may not be reliable. for example people may over/under estimate the frequency as their memories may not be accurate. In addition to this the data is personal to the individual and there may be interviewer effects. A third criticism of the Maternal Deprivation Hypothesis is that it may not be maternal deprivation that affects later development. The evidence that was collated was collected from children who were all referred to the clinic, they may have experienced many types of deprivation. Therefore it may not be maternal deprivation, but other forms of deprivation that have affected later development. Furthermore children who suffered privation may have been wrongly labelled as deprived. A fourth weakness of the Maternal Deprivation Hypothesis is that research has suggested that separation does not lead to maladjustment. Bowlby (1956) studied children with TB (who spent time in hospital and experienced separation from their mothers) and their peers. It was found that there was no difference in psychological assessment at 7 &14 years old between the two groups. Therefore it is suggested that deprivation does not have negative effect on development. Bowlby further explained that it may be individual differences that explain this finding as it may be that children who are securely attached may cope better with deprivation. Case study of John: The effects of disruption of attachment. John spent 9 days in residential nursery as his Mother was in hospital. During which time the staff had very little time to spend with John to focus upon his emotional and personal needs. John was filmed and the findings illustrated that he became withdrawn and showed despair. when his Mum came to pick him up John rejected her and showed outbursts of anger towards her. When compared to children in foster care (Joyce Robertson was a foster mother) who were able to bring personal items from home with them and visit their parents in hospital it was concluded that if substitute emotional care was provided then the effects of deprivation can be avoided. 1. The Maternal Deprivation Hypothesis has led to the formulation of the evolutionary attachment theory. 2. The Maternal Deprivation Hypothesis has impacted the way we treat children in hospitals. Care has changed and now actively encourages parents to stay overnight in order to prevent deprivation and enhance recovery speed as anxiety is reduced.